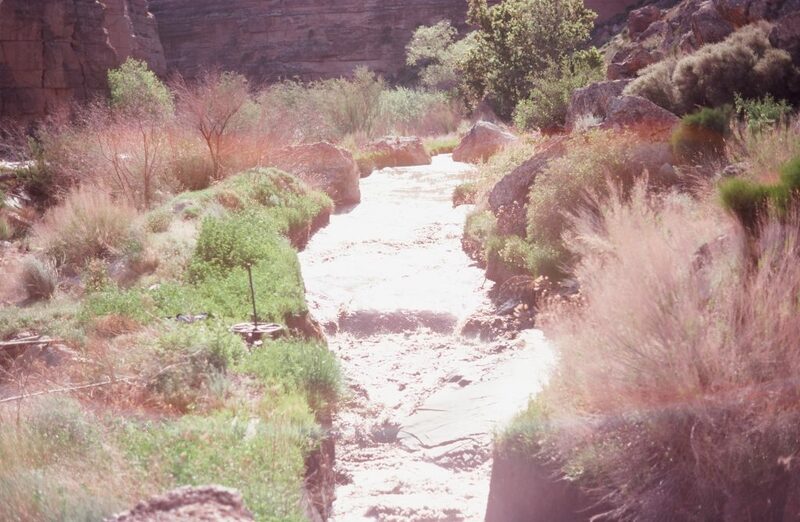 FEATURE – Settled in 1906, Hurricane was late in the whole scheme of Mormon colonization of Southern Utah but it arguably has one of the most interesting and faith-promoting foundation stories of the region considering its determined visionaries and canal builders who successfully harnessed the Virgin River to supply water to the parched Hurricane Bench. 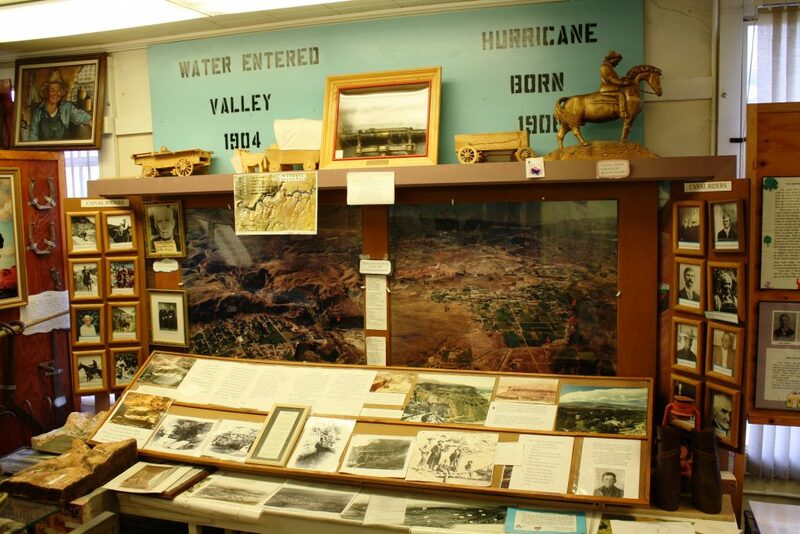 The importance of the Hurricane Canal to the region is marked by a centerpiece in today’s Hurricane Valley Pioneer Heritage Park – a large panel dedicated to the canal – and in the adjoining museum’s largest display. Hurricane has done an admirable job of giving thanks to its founders for their hard work and perseverance in the construction of the Hurricane Canal. It really is the story of Hurricane’s founding and, even though the canal was rendered obsolete nearly 30 years ago, it is still rightfully part of the town’s visible fabric. 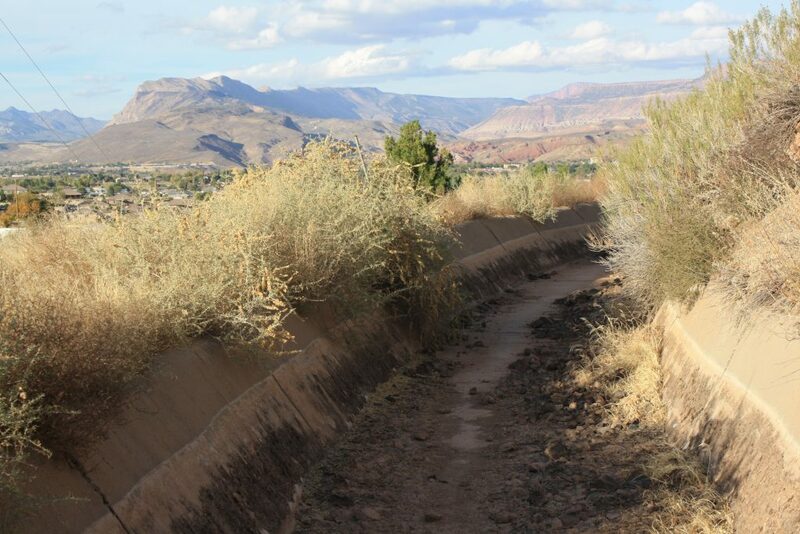 A short trail along the canal’s former route provides a glimpse into what it looked like in yesteryear. A stone obelisk monument standing by an expansive view of its course along the hillside praises its builders and maintainers. 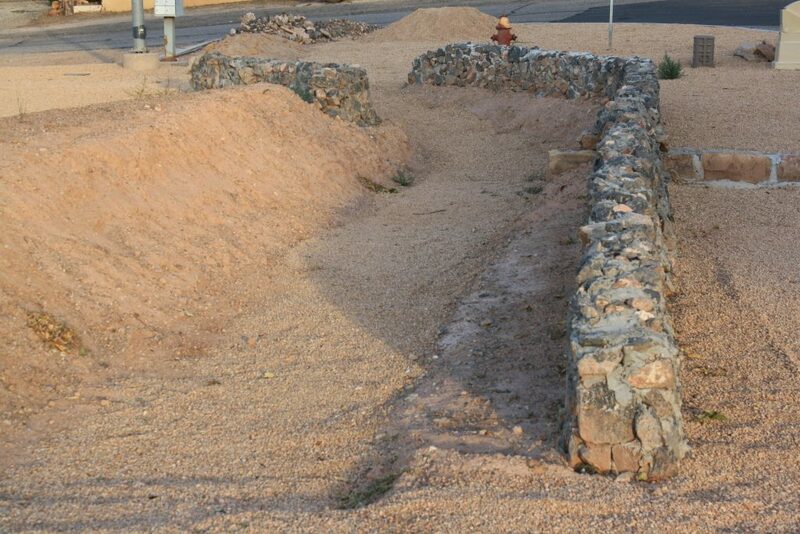 A replica of the canal is being constructed in a wayside park just off the main highway. Heck, even a musical about the canal’s construction has been performed at the town’s annual Peach Days celebration. 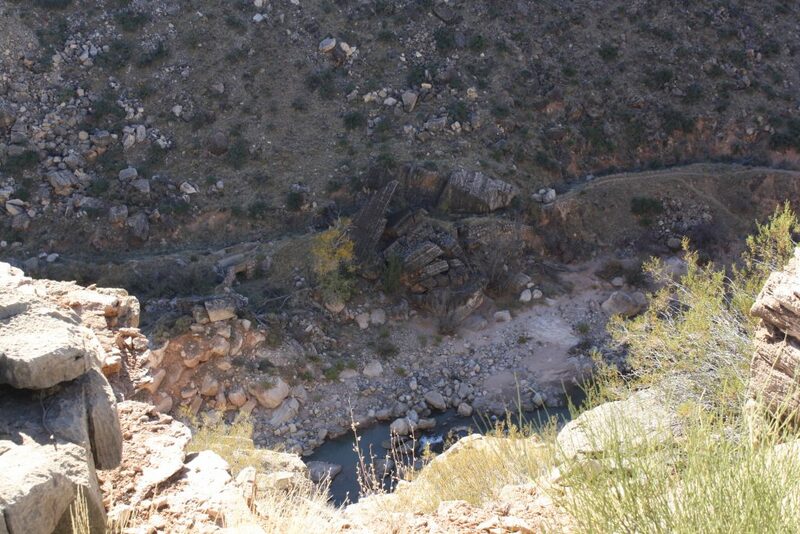 As early as 1865, surveyors assessed the feasibility of constructing a canal from a diversion dam on the Virgin River so that 2,000 acres of arable land could be farmed, concluding it an impossibility. But two visionaries, John Steele of Toquerville and James Jepson of Virgin, refused to accept that conclusion. Hurricane’s old timers know the story well. 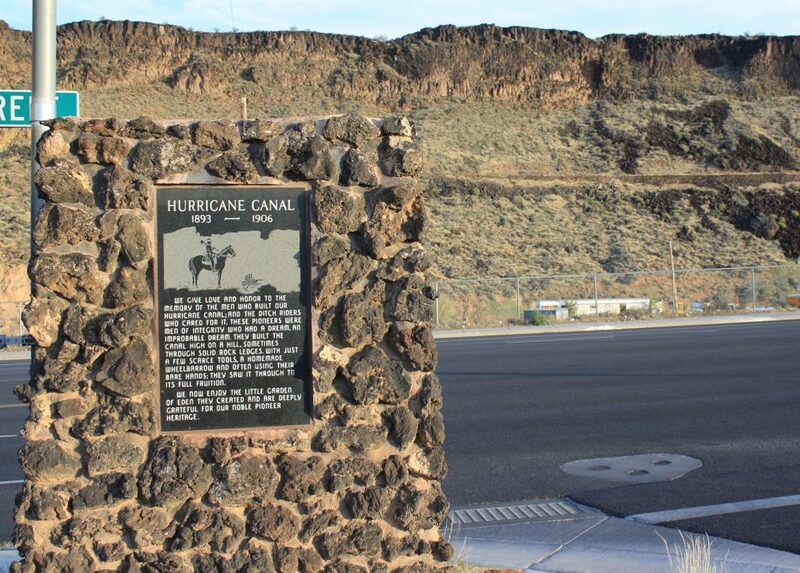 A group of upriver settlers led by Jepson and Steele met in 1893 to form a cooperative, the Hurricane Canal Company. The co-op would do what was previously deemed impossible, eventually build a canal whose route would run high above the river and reach what they considered a veritable gold mine that would change their economic fortunes. Canal workers worked for little money. Their main motivation was the guarantee of a tract of land to farm once work was finished, 20 acres, which seemed unfathomable considering the small plots they farmed in those upriver towns. 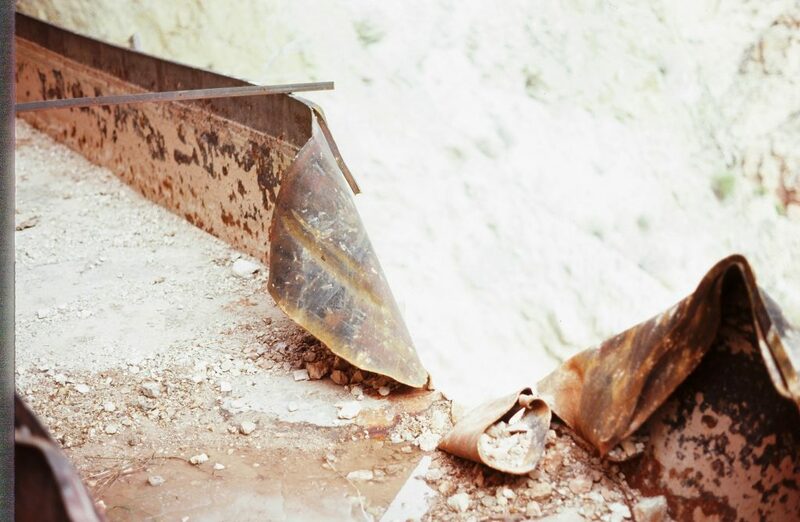 It was rudimentary work using only the most basic tools – picks, shovels and wheelbarrows. At first, there was a grand fervor for the work, but that waned as the canal company’s money ran out. The project received no government funding but instead looked to an organization with a lot of influence in the region for the cash to keep moving forward. It wasn’t until Jepson, who served as the company’s first president, made a plea to the leadership of The Church of Jesus Christ of Latter-day Saints in 1902 to secure $5,000 in the purchase of company stock that the company was in a position to complete the project, which it did in August 1904, when the first water reached the Hurricane Bench. On both occasions, the would-be settlers of Hurricane held celebrations of thanksgiving. Hurricane was settled a little less than two years later once the land was soaked and the ground sufficiently settled. However, Hurricane residents didn’t care about its aesthetics. What mattered to them was its functionality; but, keeping it functional required a lot of maintenance over the years. 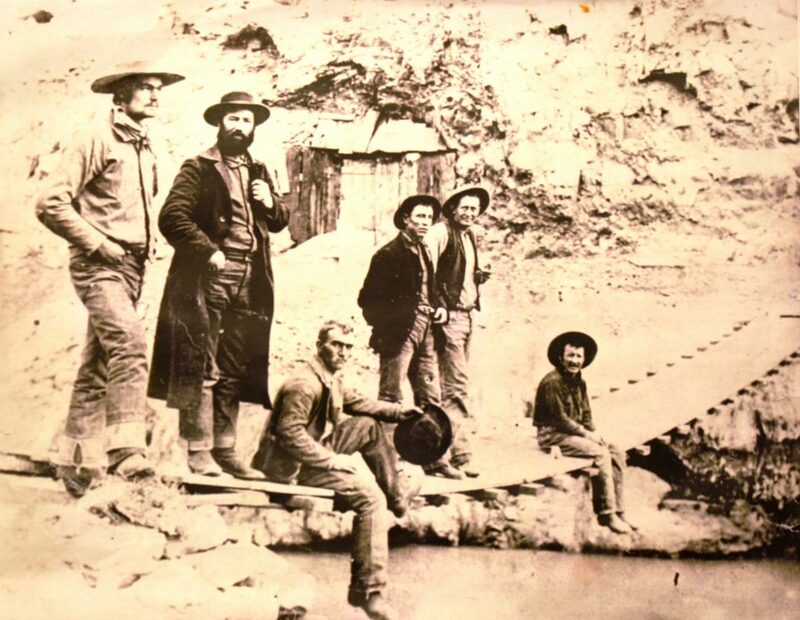 In the many accounts available on the canal’s history, very little is written about the men who were integral in keeping the canal running after it was built, the ditch riders as they were known. They rode the canal to check on it from Day One. Being a ditch rider was a 24 hour a day, seven day a week job, said Carl Wadsworth, who served as a ditch rider from 1974 to 1977. 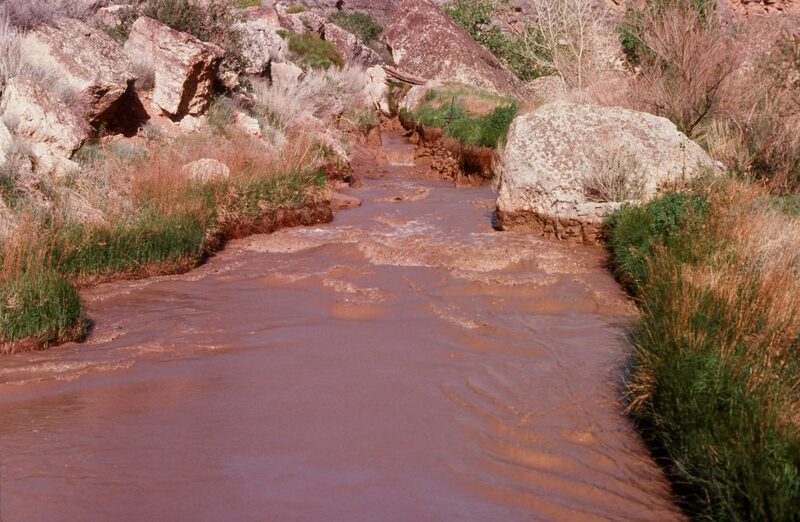 A ditch rider’s main concern was the portion of the canal up the canyon, which didn’t have the advantage of people living below it to report any problems as the portion above town did. When a major leak showed itself, water had to be diverted out of the canal via one of the headgates so it could be repaired. 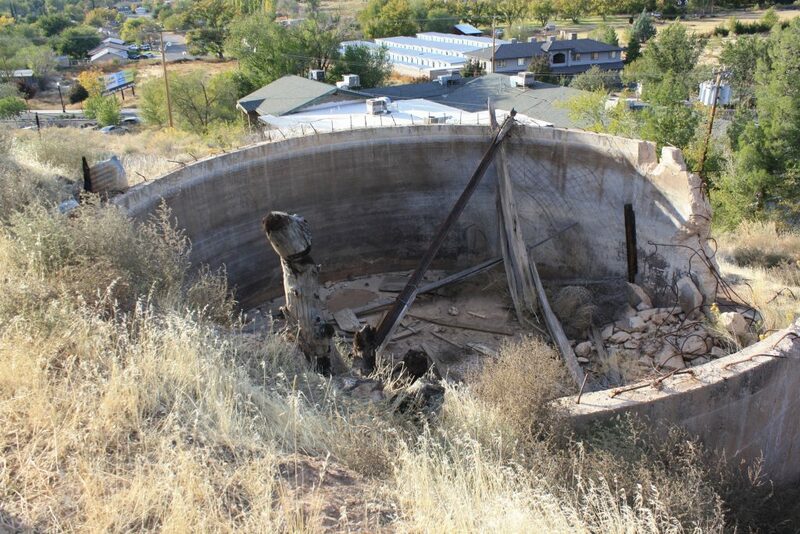 Wadsworth remembers one bad leak above where the Kolob Rehabilitation Center is now, which had to be patched by pushing wheelbarrows of cement up to the canal. 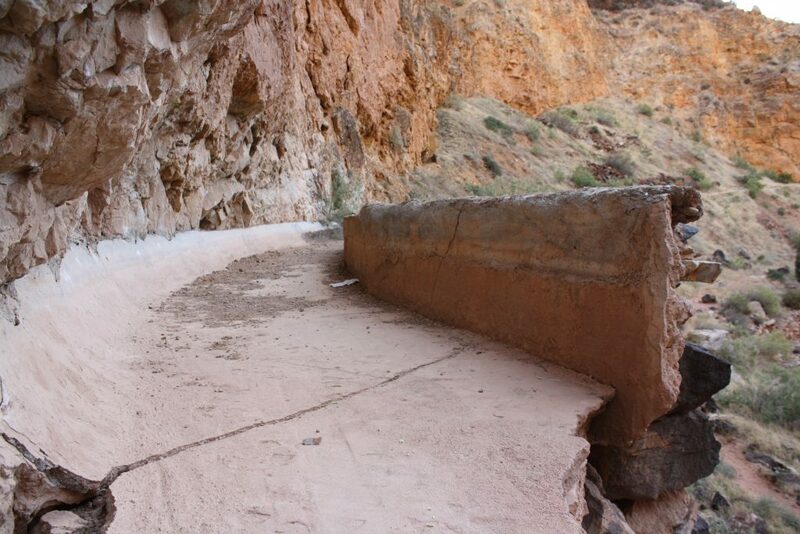 Wadsworth said many of the minor leaks up the canyon could be repaired simply by patching them with shovelfuls of dirt and gravel. He said he’d see a whirlpool in the canal where the leak was and jump in the canal, without waders, to patch it. A ditch rider never carried a shovel, but there were always shovels stashed along the canal’s course. 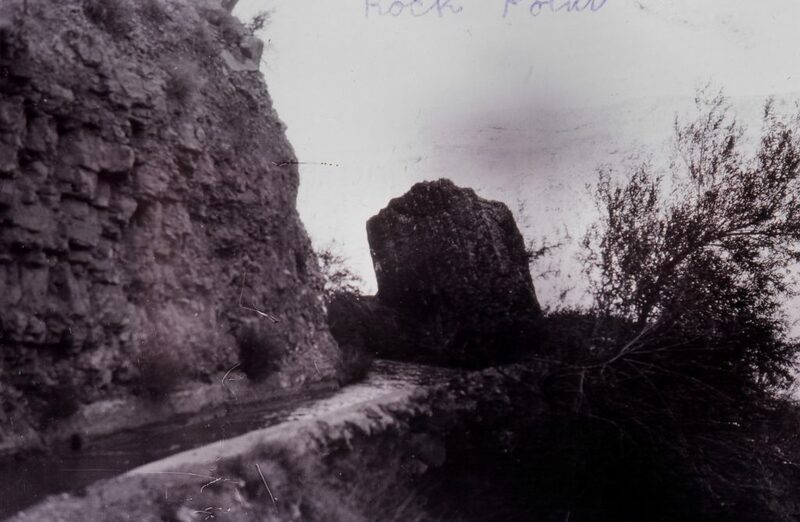 When difficult-to-move, large boulders fell into the canal, ditch riders had to painstakingly drill holes for dynamite to break them up into smaller pieces that could be more easily moved. 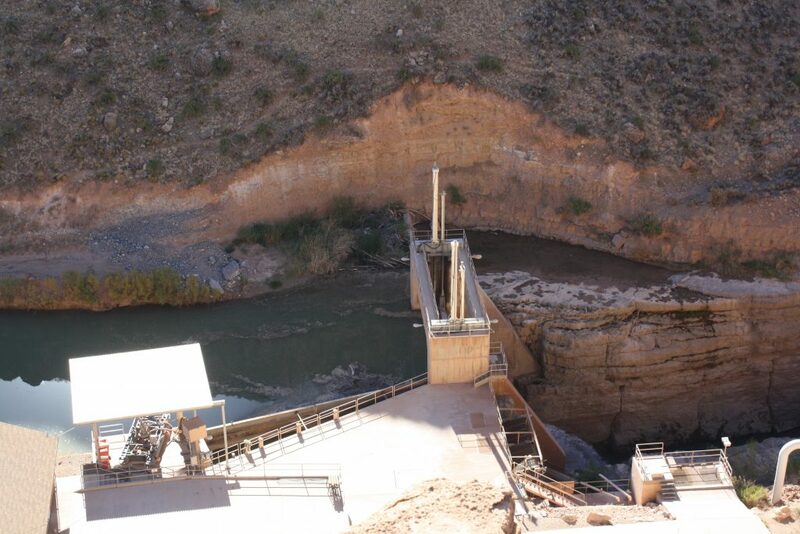 The headgates were built mainly as safety measures. 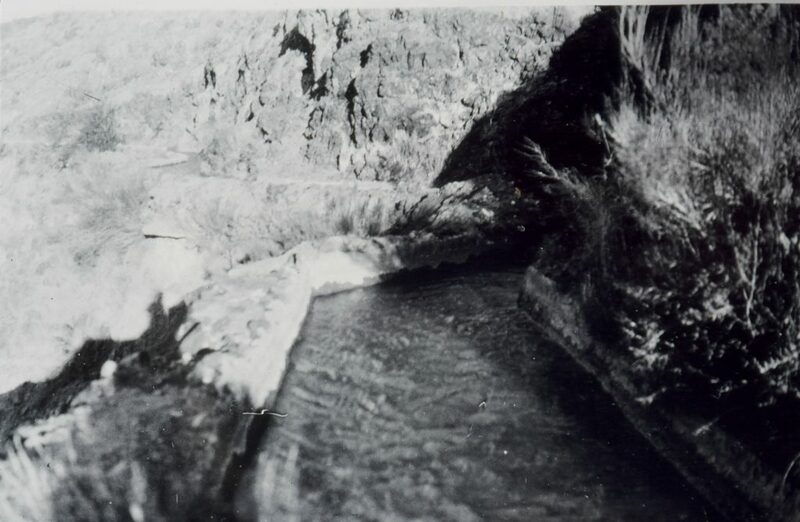 During violent rainstorms, Wadsworth said he would open the headgate closest to the diversion dam and the one near Pah Tempe so the canal wouldn’t overrun its banks. 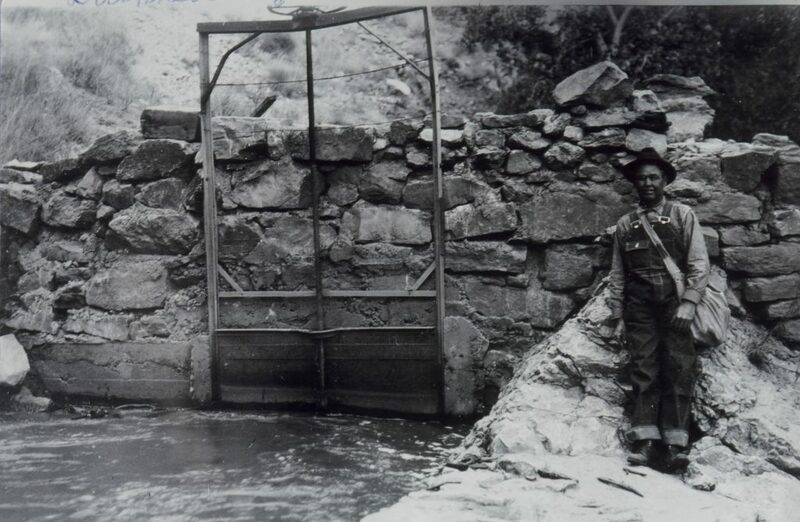 A sentry in Rockville would watch the river during a storm and call the canal rider if he thought opening the headgates was necessary. 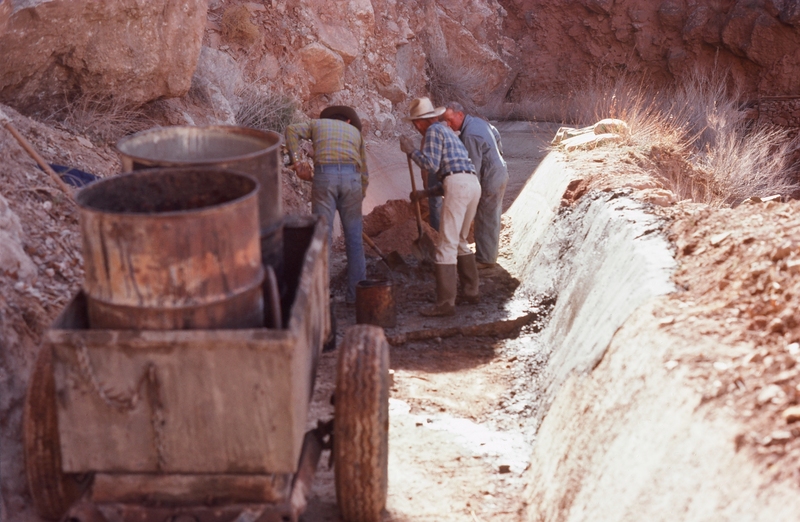 Another part of the regular maintenance of the canal was performing a “sand wash,” Wadsworth said, allowing sand that built up to release out of the headgates so it would not obstruct the canal’s flow. 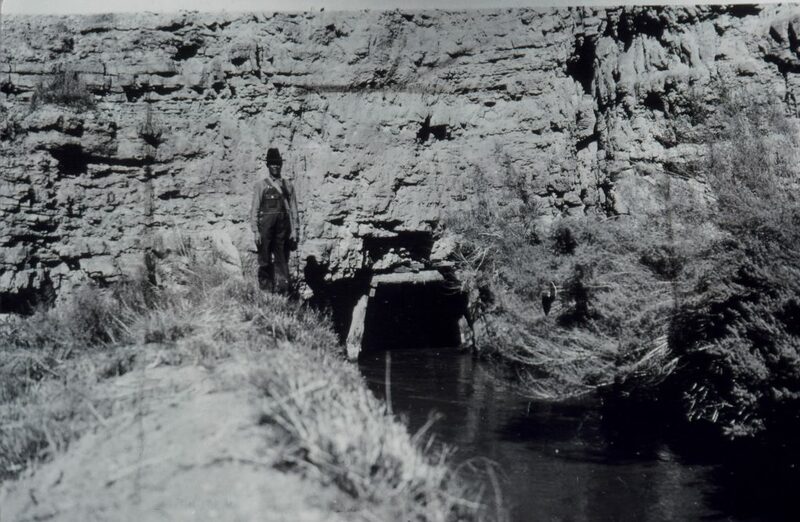 During summertime, canal maintenance consisted of fixing emergency leaks and if the repair took a long time, it messed with everyone’s water turn and made for some anxious farmers who did not want to see their crops get thirsty. The major maintenance and cleaning of the canal took place in wintertime, when the canal was dry, usually from mid-December to early March. Wadsworth said it wasn’t hard to get crews up the canal to help with the maintenance as many of their livelihoods depended on it. A ditch rider could not ride the bank the whole length of the canal because of its tunnels and flumes, but there were bypass trails to get from one bank to the next. 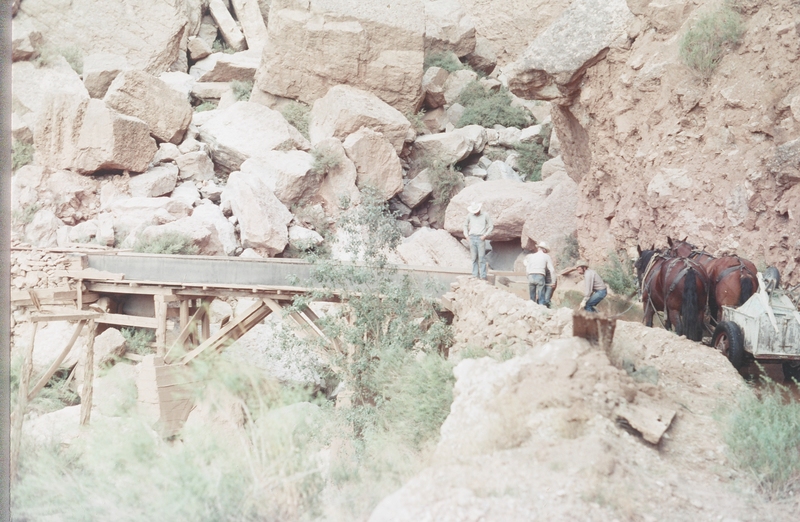 Riding a horse along the canal bank was extremely precarious in its narrow spots – approximately 2 feet wide with a sheer drop on one side and the canal’s flowing water on the other. 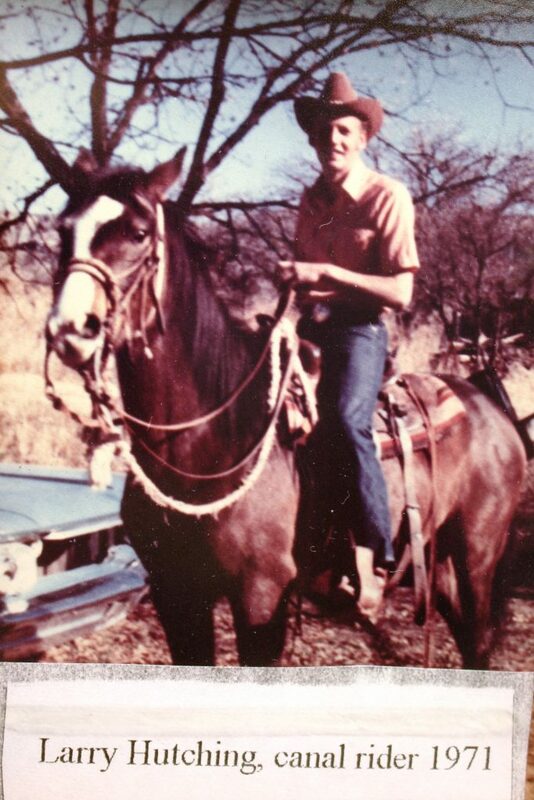 Larry Hutchings, who served as a ditch rider during the early 1970s, remembers a few times he had horses fall into the ditch while he was riding them. New horses venturing along the canal was a challenge the first few times, he said, even for horses that were well broken. 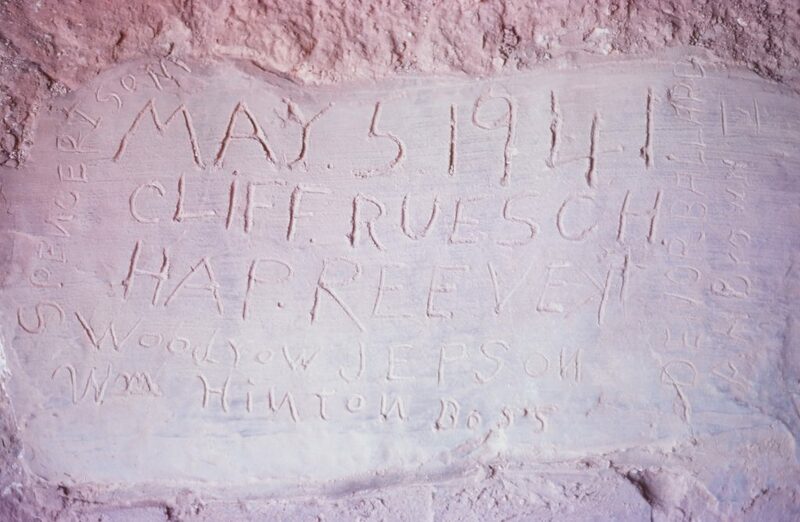 Hutchings said former ditch rider Bill Wright, father of rodeo’s famous Wright brothers, had a horse fall into the canal then jump right out over a steep ledge to its death. To help their horses’ psyche and confidence in traversing the narrow canal banks, ditch riders snugly placed 30 to 50 foot ash logs bound together by heavy wire on either side of the canal bank so it would appear wider. Wadsworth said the first time any new horse crossed such spots, the ditch rider had to dismount and lead the horse across. Thankfully, Wadsworth said, if a horse stepped on one of the logs, it could support the horse’s weight. It paid to have a good horse underneath each ditch rider, Wadsworth said. Clover was the only horse he rode during his ditch riding career because she was completely acclimated to it. However, there was one thing Clover wasn’t used to: sheep. 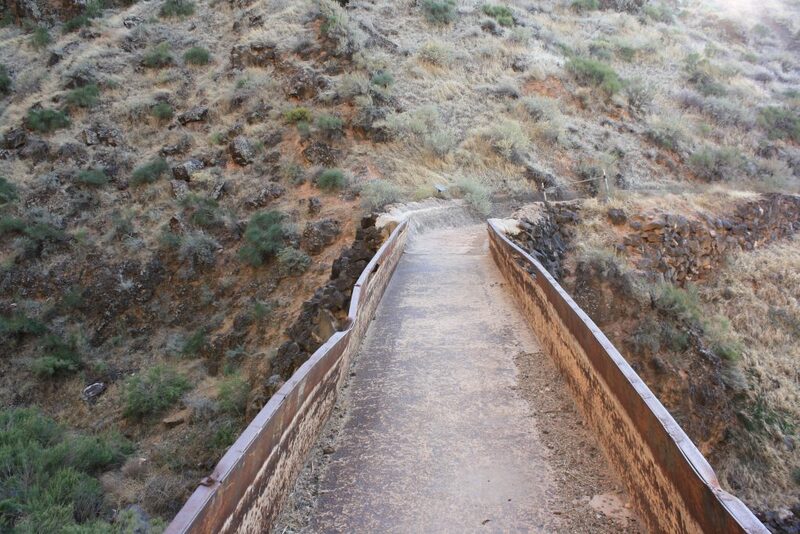 At one of the headgates up the canyon, there was a fence with a gate ditch riders could close to let their horses graze. Wadsworth said he never had to close the gate as he trusted Clover would never go astray. One day, however, he returned after letting Clover graze and she wasn’t there. She had been scared off by a herd of sheep running down to the river. Wadsworth thought he would have to walk back home, but he didn’t get very far before Clover came trotting up to him again. Often, Wadsworth’s dog, Prince, would accompany him on his canal rides. He was glad for the canine company, he said, especially when the dog warned him of rattlesnakes nearby that could have spooked Clover to the point of bucking him off – a fall that could have resulted in severe injury or death. “When you’re doing a job like that, you don’t think about the dangers,” Wadsworth said. Looking back, he said, it scares him to think about what could have happened but thankfully didn’t. Hutchings admitted the dangers didn’t even cross his mind because he was so accustomed to riding a horse. 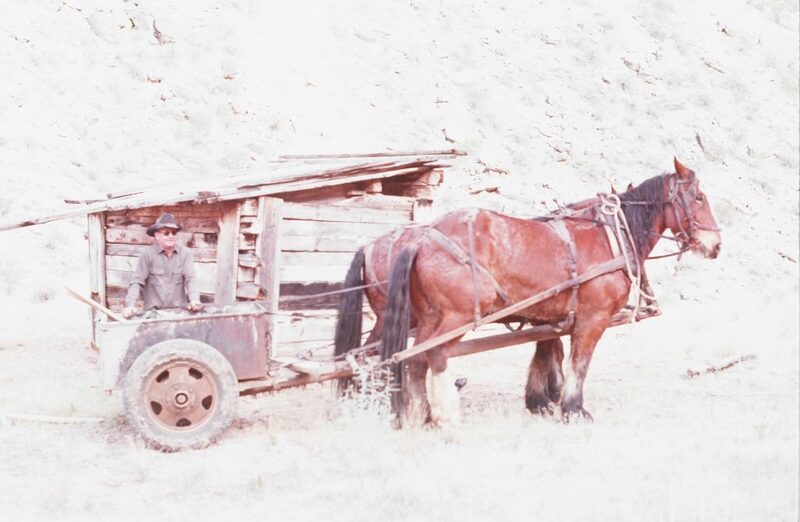 The dangers of the ditch rider job did claim a few horses over the years and one ditch rider, in 1958. 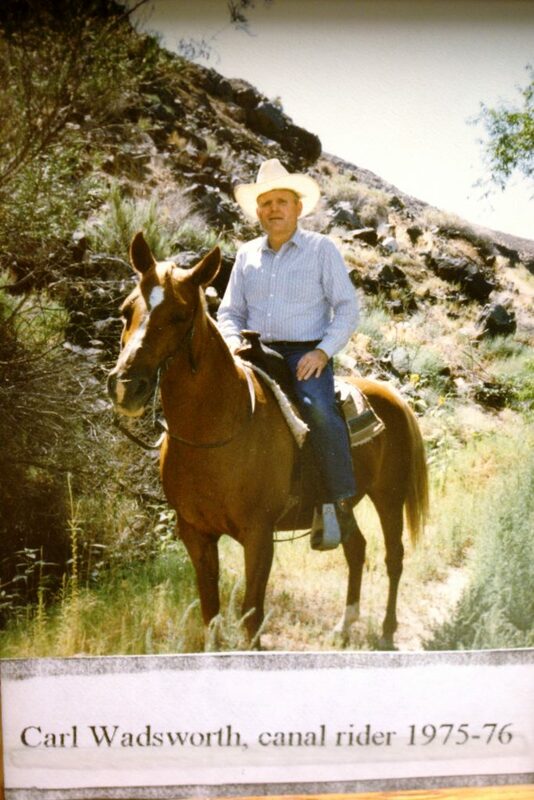 Frank Lee’s horse bucked him off after it was spooked by a falling log he lassoed out of the canal. 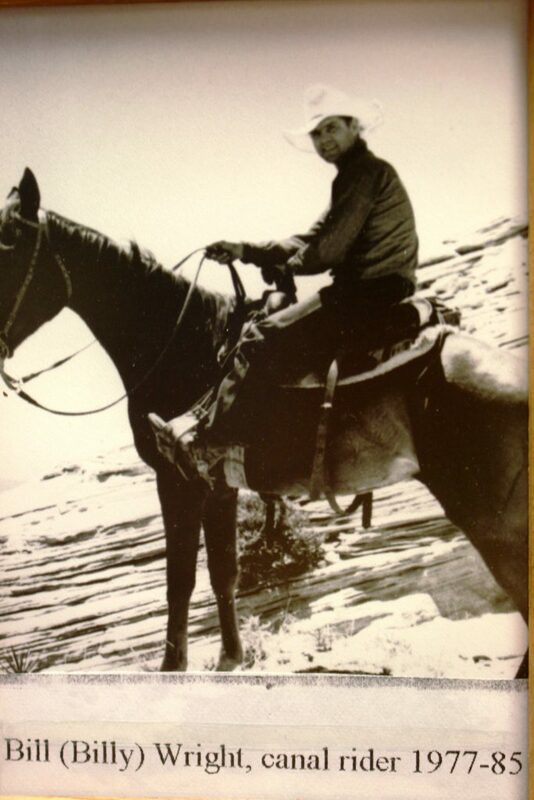 Lee was able to remount his horse and ride into town but suffered a punctured lung and died from his injuries in the hospital later the same day. Interestingly, Lee was the father of the only female ditch rider, Dixie Lee, who served as a fill-in for him and served on an interim basis before the canal company found her father’s replacement. 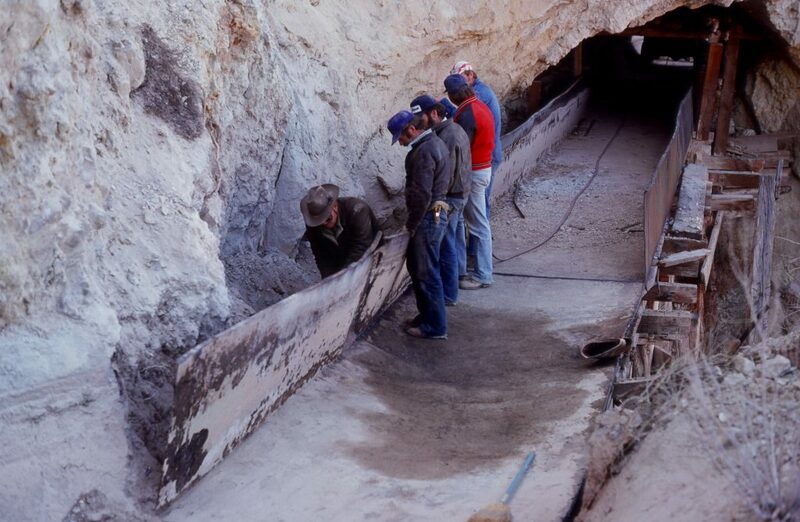 Hutchings, Wadsworth and Wright are the only three surviving ditch riders. 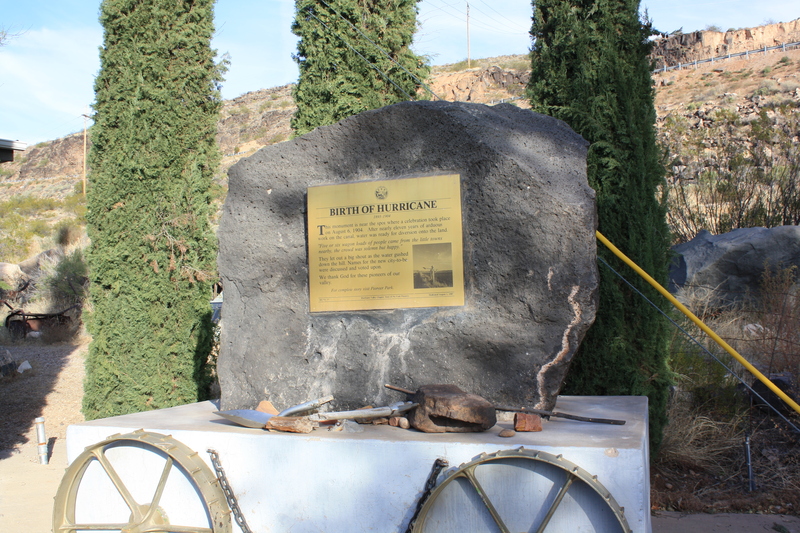 As part of the canal’s centennial in 2004, Hurricane City honored them for their service with a plaque. They also rode in the Peach Days Parade that year as part of the recognition. Lazy rivers at water parks have nothing on the Hurricane Canal in its glory days. 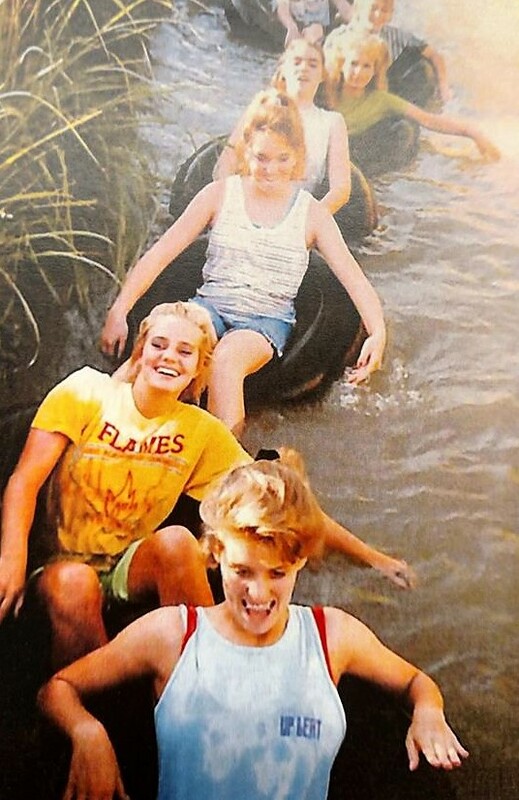 For those who grew up in Hurricane while the canal was running, tubing down it, especially the portion above town, was almost a rite of passage. It was so popular that Hurricane resident Harlen Winder operated a tube rental business from his shop on State Street. 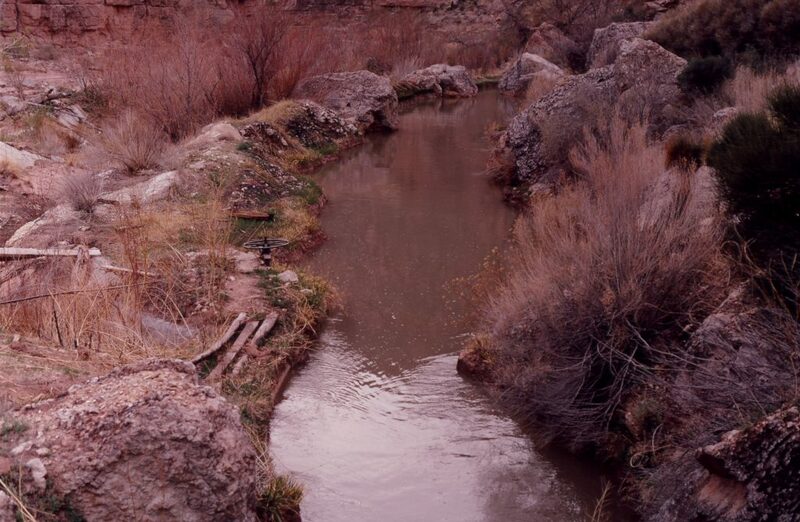 In 1985, the portion of the canal through town, starting just south of the hot springs, became the only part of the canal available for tubing when the Washington County Water Conservancy District built a dam a little upstream from the canal’s diversion dam to siphon off water to fill Quail Creek Reservoir. Thus ended the need for ditch riders. 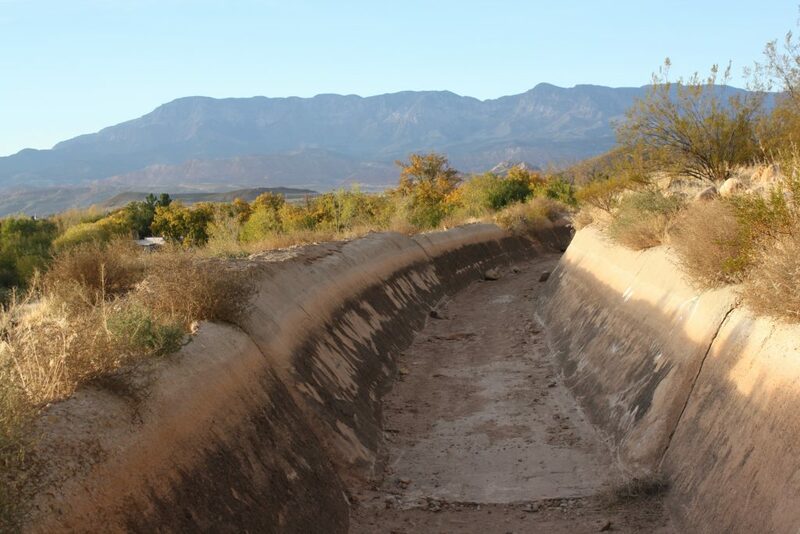 The Water Conservancy District installed a pipe at that location that continued to feed the canal above town for the next five years. 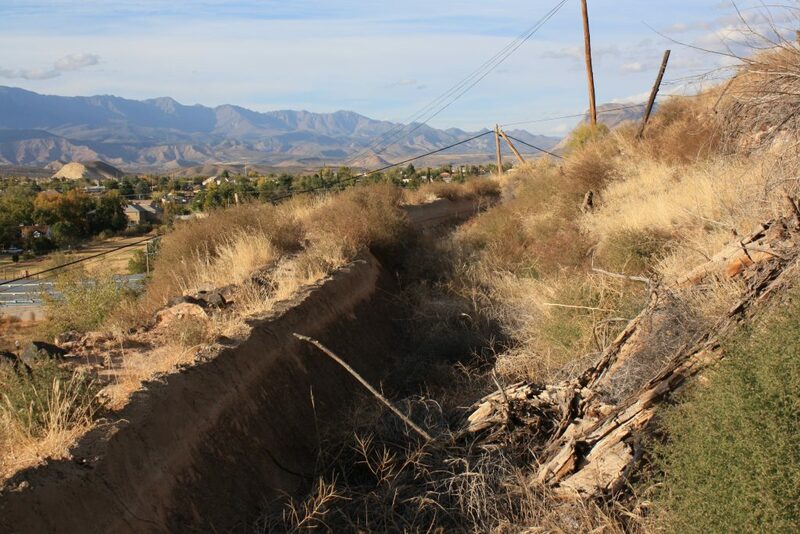 In 1990, the canal was rendered obsolete with the installation of pressurized irrigation lines, ending a truly significant era, which, thanks to the town’s reverence of its foundation story, will not be forgotten. 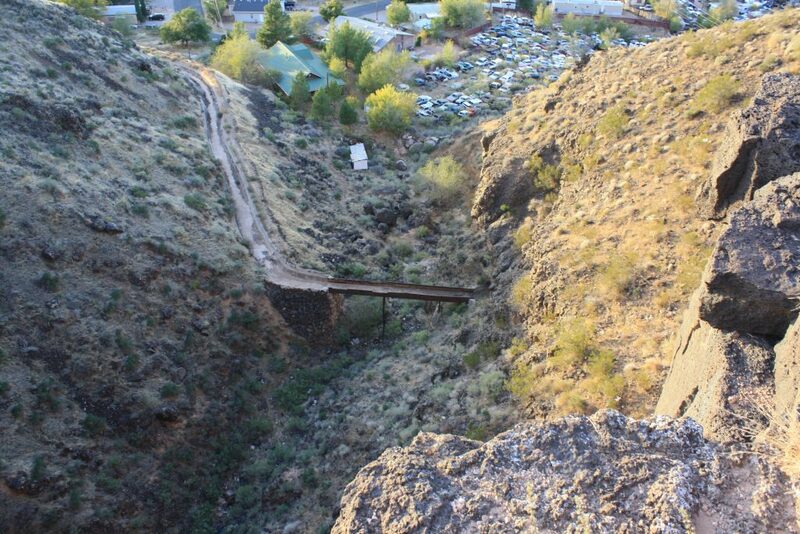 The canal remains hanging along the canyon wall and on the hillside above the city of Hurricane, but it is a shell of its former glory. 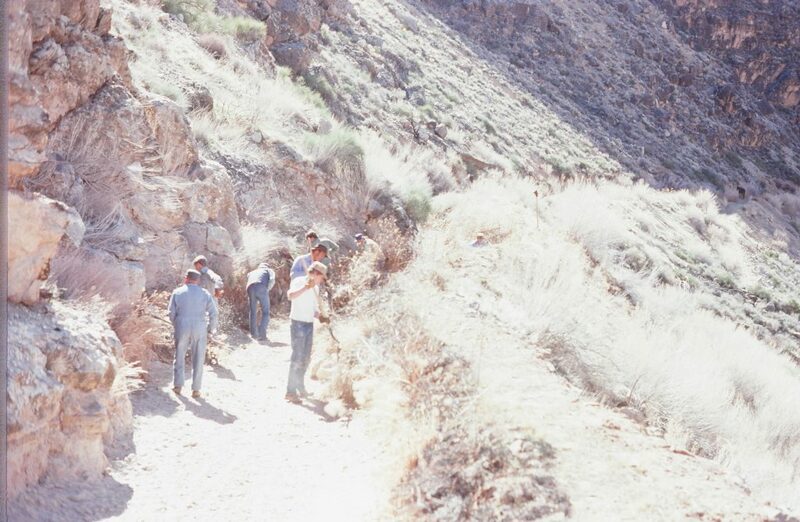 Numerous sections have been damaged or completely caved in by rock slides and some sections have filled with debris, weeds or both; other sections are still clean and intact like they could still take on water – and they do as a flood-control measure. 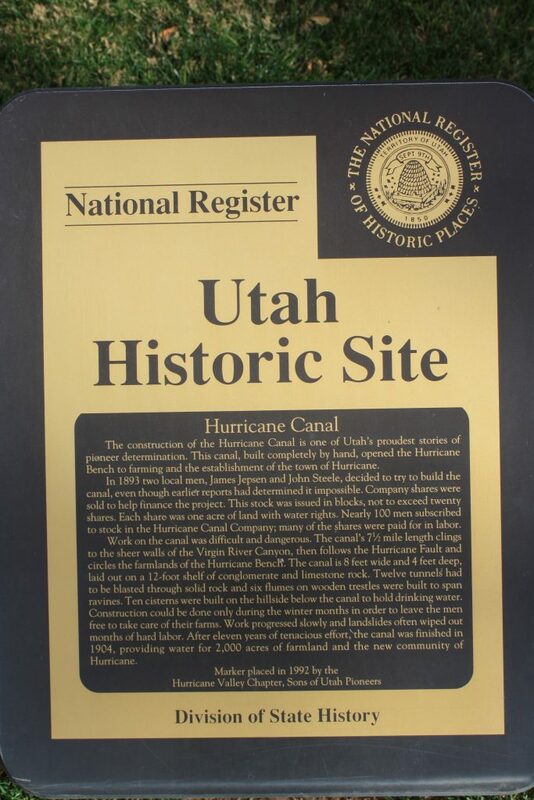 The starting point for anyone interested in the canal’s history should be the Hurricane Valley Pioneer Heritage Park and Museum at the corner of State Street and Main Street, which boasts a few markers in the park explaining the history of the canal and a large display about it in the museum. 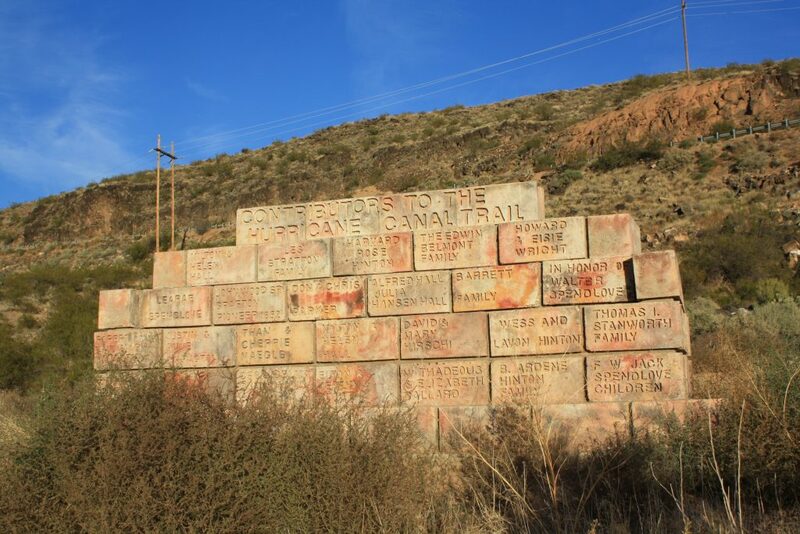 The easiest access point to view the canal is the trailhead at the end of 200 North, east against the hill, marked by a bowery and a monument dedicated to the canal builders. 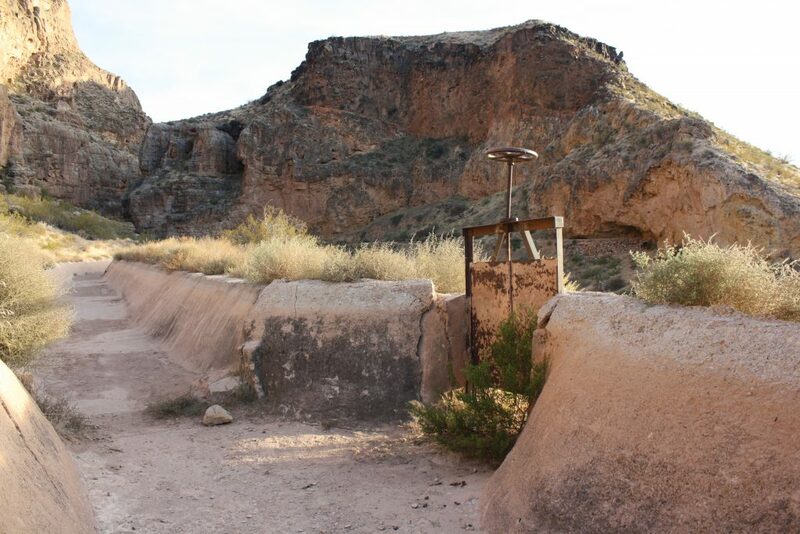 Another access point is the Three Falls Trailhead, which is at the end of 60 East south of 400 South. 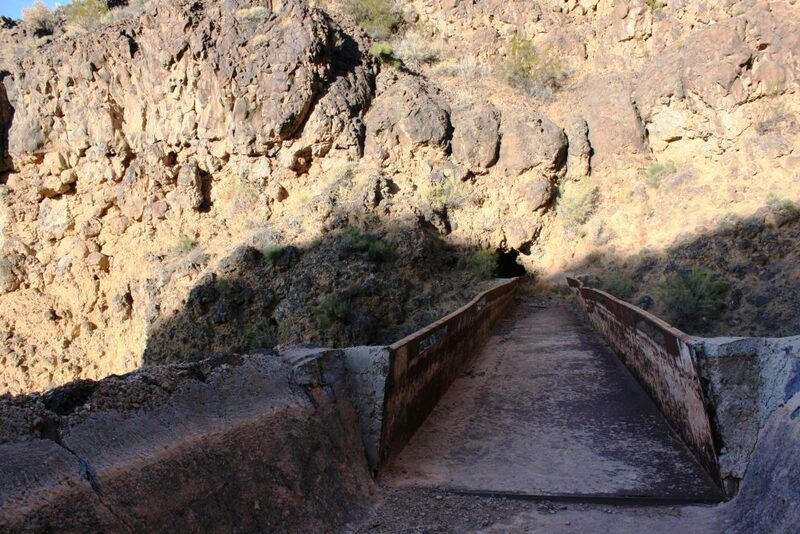 The more adventurous can access the canal in the canyon via the Virgin Dam Trailhead by driving on Highway 59 east from Hurricane for 3.4 miles, then turning left on a dirt road at mile marker 19. Drive down this road for 2 miles then turn left at the Hurricane Canal Trail sign, where it is 1.5 miles to the trailhead. To view more information about the Hurricane Canal and more historic photos of it, visit the Washington County Historical Society webpage. Pictures from a 1971 government study on the canal can be viewed at the following search results webpage on the Library of Congress website. Editor’s note: Carl Wadsworth, quoted in this story, is the author’s father. Great article Reuben! One of the best I’ve read in the St George News. Hope you contribute more about the history of the area. We agree, statusquo. Do you know this is part of a regular series that publishes every other Sunday? 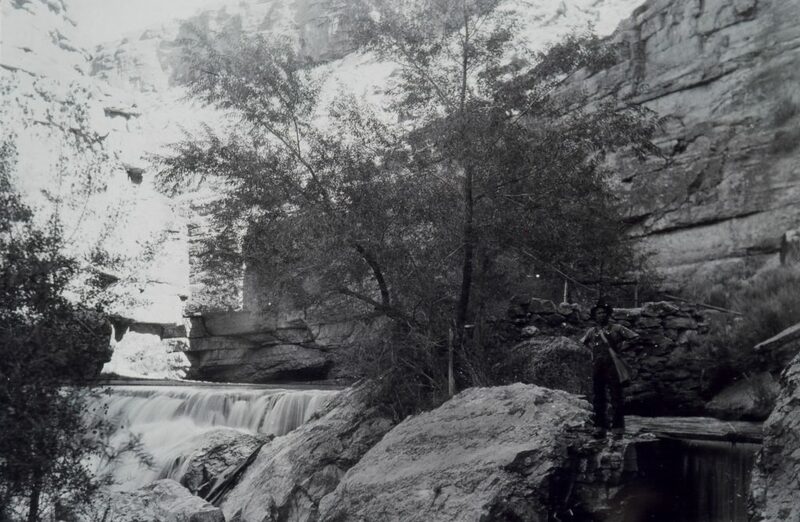 Our “Days” series comprises stories about people and places, industry and history in and surrounding the region of southwestern Utah – things our readers can enjoy and explore in a day’s visit. Click this link to see all the articles in the St. George News “Days” series. Thank you for the positive comments everyone. I’m so glad you enjoyed the article. “Comments” – as for one on Mountain Meadows, that is one I haven’t wanted to touch, but perhaps in the future I’ll change my mind.